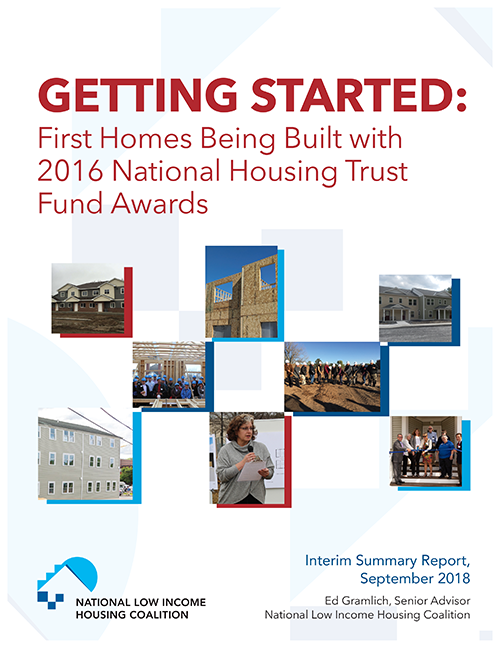 This month, the National Low Income Housing Coalition published Getting Started: First Homes Being Built with 2016 National Housing Trust Fund Awards, profiling how 42 states have awarded their inaugural 2016 national Housing Trust Fund (HTF) allocations. Prosperity Indiana pushed for the National HTF program’s creation and funding, so it is encouraging to see these funds deployed to increase the supply of housing for severely cost-burdened households. The HTF, a block grant to states, is the first federal resource since 1974 for building, rehabilitating, or preserving homes targeted to extremely low income (ELI) households, those with income at or less than 30% of the area median income or less than the federal poverty line. The HTF is funded through a dedicated source, a small assessment on the volume of new business for Fannie Mae and Freddie Mac. Nationwide, states are using most of their HTF resource for projects that will serve people experiencing homelessness, people with disabilities, elderly people, and other special needs populations. At the time of publication, 129 projects have been awarded 2016 HTF money, with about 1,500 HTF-assisted units anticipated to be constructed or rehabilitated. In Indiana, four projects have been awarded with a total of 53 HTF-assisted units. Indiana was one of only seven states with more than 50 units. The first allocation to states in 2016 was $174 million in HTF funding was allocated to states. It was followed by more than $219 million allocated for 2017 and nearly $267 million for 2018. For information about the HTF program in Indiana, click here.